The early '90s found the Chi-Lites aiming at the urban contemporary market with decent and pleasant results. Just Say You Love Me isn't in a class with the Chicago group's triumphant albums of the 1970s, but it isn't anything to be ashamed of either. An impressive remake of Marvin Gaye's "Inner City Blues" is one of the little-known CD's strong points, as is the silky ballad "Solid Love Affair" (which sounds like something the Chi-Lites would have done at the height of their popularity). But on the whole, Just Say You Love Me isn't very retro-sounding. On memorable cuts like "Just You and I Tonight," "There's a Change" and "Eternity," the Chi-Lites are clearly thinking of the Luther Vandross/Freddie Jackson crowd. 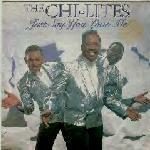 Although not essential, Just Say You Love Me was a welcome addition to the Chi-Lites' catalog.